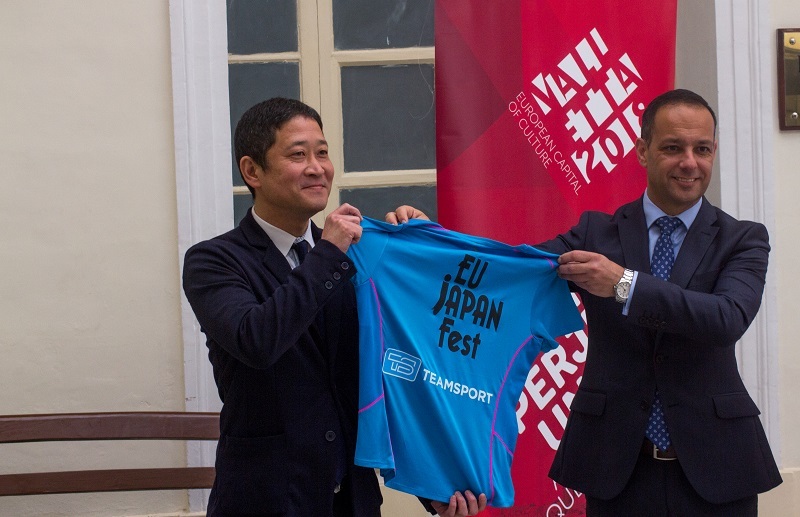 Mr Shingo Endo, MTA’s representative in Japan, with Valletta 2018 Chairman Mr Jason Micallef, showing the t-shirt which will be worn by Japanese athletes during next Sunday's marathon. Valletta 2018 Chairman Jason Micallef earlier today gave account of a recent visit to Tokyo while also announcing a series of cultural exchanges taking place between Tokyo and Valletta from now till the end of 2018. As part of this exchange, 100 Japanese athletes that have participated in last February’s internationally-renowned Tokyo Marathon in Japan will also be participating in next Sunday’s Vodafone Malta Marathon, thanks to efforts by the Valletta 2018 Foundation. “This is another instance of how Valletta 2018 is delivering a cultural experience of Valletta and Malta as a whole to the Japanese people.” Valletta 2018 Chairman Jason Micallef said. Mr Micallef was present in Tokyo earlier this month to attend the EU-Japan Fest Annual General Meeting where he met with the EU Japan Fest (EUJF) committee’s new Chairman Nobuyuki Koga, Chairman of Toyota Motors Corporation Takeshi Uchiyamada, and EUJF Secretary General Shuji Kogi. Mr Micallef also delivered a speech on the Valletta 2018 Cultural Programme at a conference organised by JATA (Japanese Association of Travel Agents), in which the most successful travel agencies in Japan were present. The EU-Japan Fest is an organisation based in Tokyo which has had cultural links with all European Capitals of Culture through the years since 1993 when Antwerp was the European Capital of Culture. There are a number of initiatives that are already benefitting from the collaboration between Valletta 2018 and the EU-Japan Fest which will continue to receive support from now till the end of 2018. These include the Valletta Design Cluster, a flagship project for Valletta 2018, which sees the regeneration of the Old Abattoir, and Modern Music Days, a joint project with Valletta 2018, Teatru Manoel and the Malta Association of Contemporary Music. In 2018, an event titled the EU-Japan Fest Weekend which celebrates this international collaboration is also planned, as well as other artist exchanges between Malta and Japan. Valletta 2018’s collaboration with EU-Japan Fest dates back to 2014, when Mr Micallef met Mr Kogi in Riga, then European Capital of Culture of Latvia. Numerous Maltese artists including Valletta Design Cluster project leader Caldon Mercieca and current artist-curator of the Malta Pavilion at the Venice Biennale Raphael Vella, have already benefitted from this collaboration. Last October, the Valletta 2018 Foundation collaborated with Aġenzija Żgħażagħ and EU-Japan Fest as well as the Japan Media Arts Festival on the Divergent Thinkers project in which Maltese artist Sarah Marie Scicluna won the prize of a month-long residency at the Youkobo Art Space in Tokyo in August 2017 for her artistic work. Japanese artist Keita Onishi was also brought over from Japan to exhibit his work during the Divergent Thinkers exhibition, which was held at the Malta Maritime Museum. Other projects which have benefitted from the Valletta 2018-EU Japan Fest collaboration include the previous two editions of Valletta 2018’s annual conference, and last year’s edition of the Valletta 2018 Curatorial School.